In 2010 Razer introduced the Onza, an Xbox 360 controller with enough extra bells and whistles to get it banned from Major League Gaming tournament play. Expect the same treatment for the Sabertooth, a refinement of the Onza that adds even more bells while removing select whistles. It's not about cheating; it's about versatility. When the MLG banned the Onza from play, many professional players were up in arms over the possibility of programming macros into the controller. Thing is, you can't program macros into Onza. It's just a comfortable alternative to the standard Xbox 360 controller with a pair of additional trigger buttons that can be assigned to any other controller function. It's just remapping. Want your jump button on the shoulder of your controller? It can do that. Want rapid-fire? Move your finger faster. 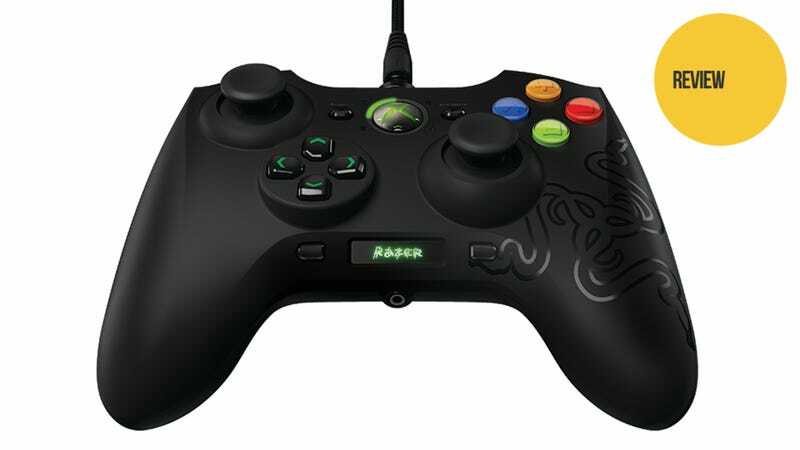 The Razer Sabertooth ($79.99 at Razerone.com), revealed to the world-at-large today but in my hands for the past couple of weeks, is an improvement to the Onza design. Instead of two programmable buttons there are six—two re-positioned triggers and a pair of removable rockers underneath the controller. The shoulder button placement is one of the Sabertooth's biggest improvements over its predecessor. Where the Onza had two horizontal buttons on each shoulder with a trigger button underneath them, the Sabertooth nestles its programmable buttons between the shoulder and triggers towards the center of the unit. This makes it much harder to accidentally hit the extra bits, without making it difficult to tap them on purpose. The pair of two-way rockers on the underside of the unit take a little getting used to. At first I was tempted to simply remove them using the included tool and forget they ever existed. Then I started playing the PC version of Kotaku's Game of the Year contender Spelunky and had trouble mixing up my jump button with my action button. This brings me to the coolest new feature on the Sabertooth, the tiny OLED screen on the bottom of the unit. The button to the left of the display opens a menu, allowing the user to quickly map the additional buttons, control LED lighting, toggle force feedback and test each of the controllers inputs. It also allows for two different saved button profiles, switched via the button to the left of the OLED screen. It's incredibly intuitive for a menu system with such a small text window. With just a few quick button presses I mapped my Spelunky jump button to the underside of the controller, leaping through the air with a twitch of my ring finger. I'll probably just lose the tool to remove the switches, even with the molded carrying case Razer includes with the Sabertooth. The hideous sectioned directional pad of the Onza has been replaced with one similar to the classic PlayStation design, immediately making it more suited to most fighting games than the standard Xbox 360 controller. The braided controller cable disconnects from the unit, a feature with little benefit above making me feel like I am assembling a weapon when I remove the unit from its case. My favorite features of the Onza—the comfortable rubber coating and the hyper-responsive mechanical face buttons—top off what might be one of the best third-party Xbox 360 controllers I've had the joy of using almost exclusively on the PC because I can't stand corded Xbox 360 controllers. I leave that to people that don't have to worry about toddlers and cats leaping gracefully into their cables. The Razer Sabertooth will not necessarily make you a better game, but it might just make you feel like a better gamer, with the added bonus of making Major League Gaming unnecessarily nervous.